Life is stressful. Between work, family, meetings, social commitments, and much more, it seems like we’re always running around. This kind of stress can leave you feeling anxious and upset. Here are five ways to calm down and ease your anxiety naturally. Deep breathing can help you calm down and re-focus your mind. If you start to feel anxious, step away from what you’re doing and spend a minute taking deep breaths. You don’t need to worry about specific breathing exercises or counting your breaths if you don’t want to. Just focus on slowly breathing in and out. However, if you’re at your desk, Google “take a deep breath” and you’ll find a quick one-minute breathing exercise that might help! Exercise can help your body deal with stress. Working out lowers your body’s stress hormones and it helps improve your sleep quality, which leads to decreased stress and anxiety. Those who exercise regularly see the greatest benefit, so try to do something active each and every day. When you’re stressed or anxious, it’s tempting to reach for something sweet or an unhealthy treat. However, this can do more harm than good. Eating too much sugar or salt can cause you to feel unwell, which will make you feel more anxious and stressed. Instead of grabbing a sugary or salty snack, eat a healthier option like some protein (nuts, yogurt, etc.) and drink water. Not drinking enough water can leave you feeling dehydrated, which can trigger anxiety attacks. 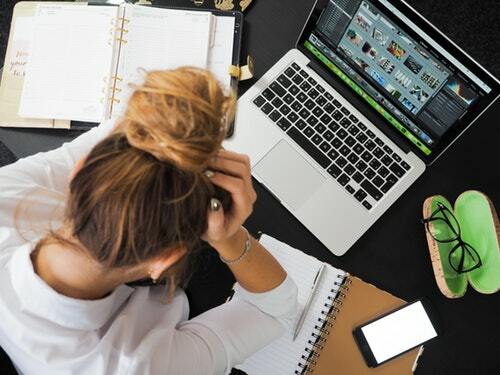 It’s understandable that when you’re busy, you may increase your caffeine intake so you can keep going, but too much caffeine can also increase your anxiety. The amount that each person can tolerate will depend on the individual, so know your limit. Coffee (and other caffeinated drinks) can be healthy – and even beneficial – in moderation, but don’t drink too much. Most people use watching TV or reading the internet as a way to relax and unwind. However, being constantly plugged-in and tied to your phone or laptop can increase your anxiety. Not only will you be more likely to check your work email when you’re looking at your phone, which can lead to stress, but too much screen time can make it difficult to sleep at night. This is especially true if you’re looking at a phone, tablet, or computer right before bed. We make it easy for you by bringing fitness to you. We keep you motivated and on track by making sure you complete a safe and effective workout. You can exercise with one of our personal trainers when it is convenient for you, in the privacy of your own home. All we ask is about 6ft by 6ft of floor space and a solid 50-55 minutes of your time. You don't need to go to the gym to get fit. There are many other ways to get in shape and one of the best ways to do it is in the comfort of your own home. Getting fit is an important part of your life and Fitness On The Go will make this as easy as possible for you. We will not only come to your home to help you get fit, will work with you to develop a custom fitness plan that will help you reach your fitness goals. All you need is some floor space in your home and about an hour of your time and we will help you reach your personal fitness goals. With all the information that is out there we know that it is tough to figure out what you need to do to get in shape. When you work with us, you will be assigned your own certified personal trainer that will help you understand the best exercises and fitness plans that will help you get fit. We don't rely on fancy gym equipment; rather we will create your customized fitness plan using body weight exercises and what you have around the house. It's not the equipment that you use, it is the hard work and effort that you put into your training sessions that will help you achieve great results. With Fitness On The Go, you can forget about those long drives and crowded gyms. They are a thing of the past. We work with your busy schedule to ensure that you get your workouts in when it is convenient for you. Contact us today to book your free in-home consultation and get your fitness plan back on track!